Scout's Take: How does failed drug test impact Randy Gregory? Published: March 26, 2015 at 03:55 p.m. Updated: March 26, 2015 at 04:51 p.m.
1. How does Gregory's positive drug test affect his status as a player heading into the NFL? Gregory's positive test puts him immediately in Stage 1 of the NFL's Substance Abuse program. He will enter an intervention program and undergo periodic testing for recreational drugs. If he violates the policy with another positive test, he faces the possible suspensions and fines for his lack of compliance. 2. How will teams view Gregory's character? Teams already had serious concerns about Gregory's character and marijuana use in the fall. Several general managers, personnel directors and scouts that I talked to in the fall cited Gregory as a "character risk" during our conversations and expressed the need to dig deeper into his background before endorsing him as a top pick. Scouts who had spent time on the Nebraska campus repeatedly told me his marijuana habits were bigger concerns than his on-field deficiencies. 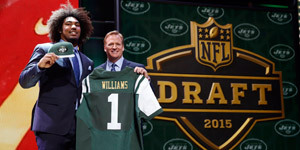 While I heard the rumors, it wasn't until Gregory admitted during an interview with NFL Media's Kim Jones that he three failed drug tests that I was able to confirm the issues that were frequently discussed in NFL scouting circles in the fall. From a team perspective, Gregory's admission to a failed test in January 2014 and April 2014 is a huge concern. He was coming off a sensational sophomore season that captivated the attention of scouts; several evaluators viewed him as a potential first-round prospect heading into the season. The fact that he had multiple positive tests in his most important season and that he continued to use marijuana despite being one strike away from being booted off the team suggests a deep-rooted problem with the drug. It's no secret the NFL has some marijuana users on its teams, but teams have problems accepting players who prioritize their recreational habits over football preparation. Thus, Gregory's inability to clean up before the NFL Scouting Combine will raise serious red flags about his maturity, professionalism and commitment to football. No doubt, the team that drafts Gregory will have to provide a support system for him. 3. What will be the impact on Gregory's draft stock? Gregory's positive drug test could torpedo his stock on draft day. Several teams around the NFL will affix a "character risk" sticker to Gregory's magnet on the draft board. Those teams could also drop Gregory down a round or two to minimize the financial risk associated with taking a player with baggage and drug issues. Ultimately, decision-makers will heed the orders of ownership when it comes to determining whether Gregory is worth the risk. During my scouting tenure with the Carolina Panthers and Seattle Seahawks, there were certain issues that were "hot button" concerns for ownership and we wouldn't consider players with documented problems in those areas. Gregory's marijuana issues will be treated differently in each draft room across the league. In some, he will be placed on the backboard and designated as an "untouchable" prospect. In others, he will only dinged as a risky candidate. 4. What can Gregory do to alter the perception teams have of him as a chronic marijuana user? Despite the push to acquire players with exemplary character in locker rooms across the league, the tantalizing allure of acquiring a talented prospect is often tough to resist during the draft. General managers and coaches want to fill out their respective rosters with a number of "blue-chip" players in key positions; Gregory certainly possesses all of the athletic traits to develop into a difference-maker as a pro. From his length and athleticism to his penchant for creating disruption off the edges, Gregory's physical tools are impressive for a versatile edge player ideally suited to play OLB in a 3-4 defensive scheme. Thus, Gregory can salvage his stock by shining in private workouts over the next month. He needs to dazzle evaluators with his movement skills in positional workouts and display a strong football aptitude in chalk-talk sessions with coaches in meetings. From a character standpoint, Gregory's admission will lead some to believe he is being open and honest about his transgressions. Some coaches will applaud him for being accountable for his actions, but others will see him as a guy attempting to orchestrate a PR move to stem the tide of negative attention. Regardless, Gregory will need to make a convincing case to decision-makers in meetings over the next month to alleviate the concerns about his character and drug issues. Moreover, he will need to show teams he can avoid temptation when he cashes a big check and that his off-field issues won't affect his on-field performance.